The seasons have become much colder. Everyone should make sure to keep warm and wear warm clothing. If there’s good food, eat a lot of it. 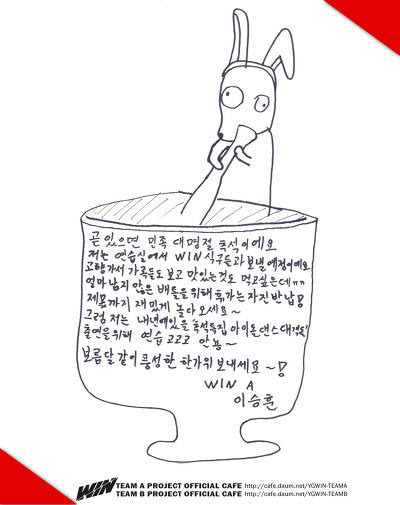 Let’s have a fun Chuseok with WIN! Cheer for Team B!! Don’t forget!!! Happy Chuseok!! I love you!!! Everyone should pass this time happily with your family members, and eat a lot of good food!!! 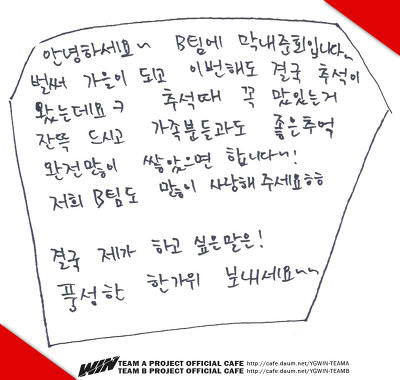 For those who are dieting, eat a lot of good food for this year’s Chuseok as well~ Your health is the most important ^o^ Also, don’t rest for too long! I will be jealous ㅠㅠ I will practice happily while thinking of our fans! I hope everyone will have a happy Chuseok! 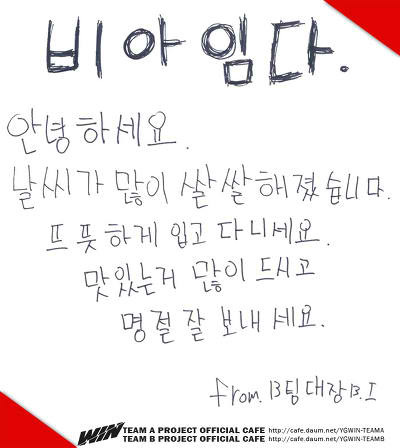 You must definitely eat until you’re full on Chuseok, and make lots of lovely memories with your family~! The last thing I want to say is! I think this is my first time greeting everyone [shocked face]!! I will be showing off my “charms” in the future, please anticipate!! 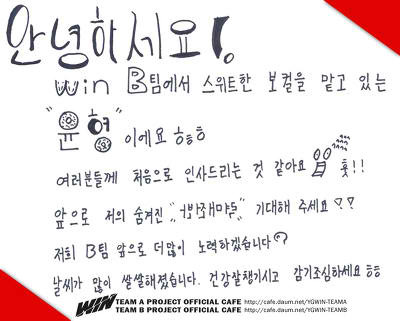 We, Team B, will work even harder in the future! This year’s break for Chuseok has been extended so eat more delicious food and spend it happily with your family! This is team A’s lucky charm and singer, the spontaneous “man” – Kang Seung Yoon!! The time for Chuseok has come. It seemed like only yesterday when the WIN show first started to broadcast, and was so sweltering hot everyday. But in a blink of an eye, autumn is already here. Everyone will be going back to see their relatives? Eat a lot of delicious food with the family you haven’t seen in a long time, and spend a joyful time with them as well. I hope that everyone will have a happy and prosperous Chuseok! I’ve always been grateful to everyone, I love you!!! 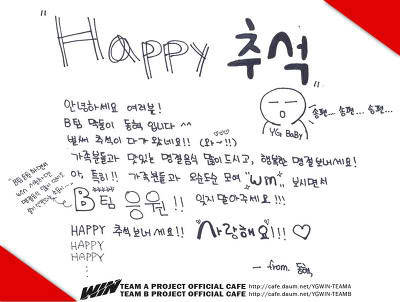 I can have a happy Chuseok as long as everyone has a happy Chuseok. I originally planned to go back home and spend it with my family ㅜㅜ But for the impending battle, I decided to stay instead. Have a happy Chuseok with the round moon~! Don’t worry about us, eat well and eat our portion as well!! If you have time, then make wish towards the full moon for our team with sense!! Anyways, please be safe and happy! Spend the holidays happily with your family! Also, on Mnet at 10PM on Friday!! You guys know this right~~? 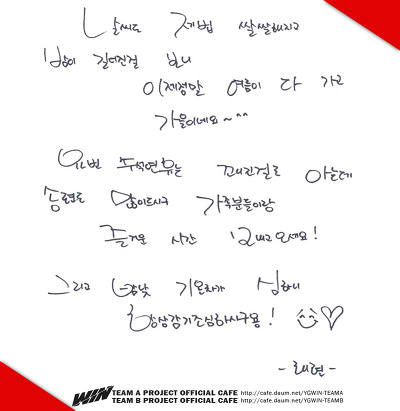 Let’s spend this year’s Chuseok and WIN together! Kang Seungyoon was praised by JYP Entertainment representative Park Jin Young. 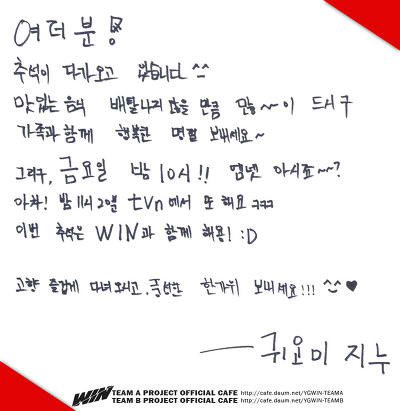 On the Sept. 13th Mnet Broadcast of ‘WIN’, all 11 of the YG trainees headed over to JYP. 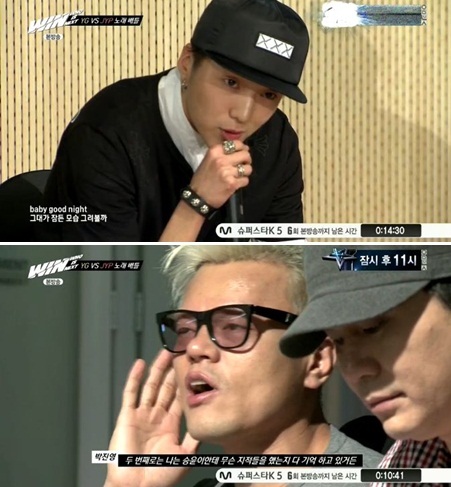 As representatives of YG, Kang Seungyoon and Nam Taehyun performed G-Dragon and T.O.P’s “Baby Goodnight” along with fellow member Kim Jinwoo for the remix of Park Jin Young’s “I Already Have a Woman.” During the performance, Kim Jinwoo mistakenly forgot the lyrics, but the members were fortunately able to escape the crisis. After finishing, Kang Seungyoon and the other two members looked understandably nervous. On the Mnet audition show of ‘Superstar K’, Park Jin Young once told Kang Seungyoon that he couldn’t see him debuting(?). ‘WIN’ is the ambitious project for YG Entertainment who will be putting out a new boy group seven years after Big Bang has debuted. 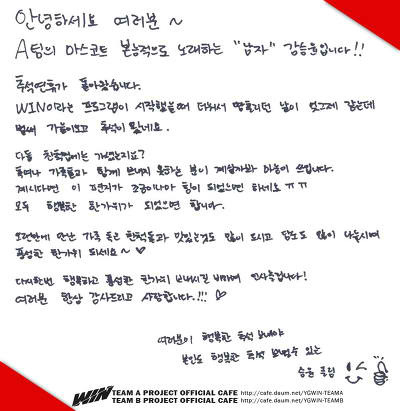 YG Entertainment’s trainee Kim Jinwoo made the mistake of forgetting the lyrics to his song. 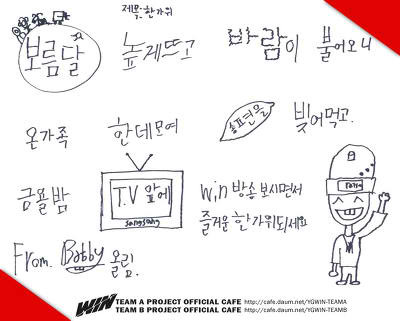 On the Sept. 13th Mnet broadcast of ‘WIN’, all 11 of the YG trainees headed over to JYP to battle with their trainees. On the day of the showdown, Kang Seungyoon and Nam Taehyun sang G-Dragon and T.O.P’s “Baby Goodnight”, and Kim Jinwoo sang a remix version of Park Jin Young’s “I Already Have a Woman”. In his later personal interview, Kim Jinwoo reflected back on the situation and said, “I’m really sorry Yang CEO.” “To my other team members, I’m also very sorry to you all.”, finally shedding tears in the process. ‘WIN’ is the ambitious project for YG Entertainment, who will be putting out their first boy group seven years after Big Bang has debuted.